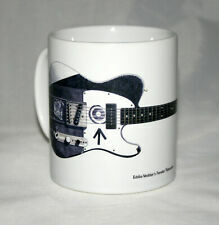 Guitar Mug. Eddie Vedder's Fender Telecaster illustration. 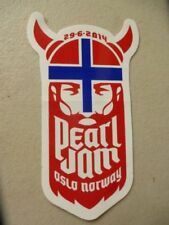 PEARL JAM STICKERS. RARE SET OF 3. Add to Favourites. (3) Ten Club Patches. Ten Club Fan Club Bundles for 2012-2014. (3) Exclusive Ten Club Print. Pearl Jam Mind Your Pendulum Shirt Size Medium. Condition is New. Dispatched with Royal Mail 1st Class. Pearl Jam Stickman Dice. Perfect Gift For 10 Club Fan. ♣️Pearl Jam Stickman Dice ♣️. Y ou g et e ve ry th in g in t he p ho to s. 3 re co rd s pl ay ed on ce, de ep magazine, s ti ck er, st en ci l, c ar ds. a great selection. RARE, limited edition Pearl Jam Volcom t-shirt. This is aSmall size shirt and has barely been worn. Slight dent to one corner (see last pic). PEARL JAM - TEN / TOUR DATES. Pearl Jam satin pass from the 2012 European Tour. This working crew chief pass is from the show at Ericsson Globe, Stockholm, Sweden on 7th July 2012. The first pressing of Place / Date from Ten Club - hardback with jacket. Perfect condition directly from Ten Club. Shrink wrap still covering slip box. Very rare item! The envelope for the prints has been opened but is included. I got the socks at a pearl jam gig. All the socks were sold out by the end of the concert. It's a big, heavy rubber doormat. It was a promotional item used to advertise Ten, way back in 1991. EDDIE VEDDER PEARL JAM. ITEM BETTER THAN PICTURE. PEARL JAM PORTUGAL AND SPAIN 2006 TOUR. Pearl Jam Vancouver BC Canada 2005 Tour Poster 27x15cm from Book to Frame? PEARL JAM Ref B2. ITEM BETTER THAN PICTURE. Pearl Jam Insignificance Lyric Binaural Eddie Vedder 25x20cm from Book to Frame? BETTER THAN PICTURE. LYRICS TO SONG, AS TITLE. Up for sale here is Third Man Records Vault 29-- everything but the record from this Pearl Jam set. This includes everything pictured: Pearl Jam / Third Man patch and pin, along with the beautiful hardcover photo book and original insert detailing the package. A new clock piece. This is a 12" record clock. I choose a design and hand cut a series of stencils. I then hand paint in the finer details. OLD VINYL RECORDS UPCYCLED INTO STUNNING GIFTS. which i use for the basic design. This is a rare pick from Eddie Vedder of Pearl Jam. This is unique with the Cubs bear and Eddie's initials on the one side and the number 1 on the back side signifying Eddie's favorite Cubs player Jose Cardenal. Original screen printed tour poster - there's a little discolouration on the back from when I had this in a frame but it's been in a storage tube for a number of years - no fading of the colours etc. Marks are at the edges and won't show when mounted. Very nice vibrant poster - feel free to drop me a line with an offer. Pearl Jam/Mariners logo shirt, given away at Safeco Field during the Pearl Jam fireworks night on July 20, 2018. Size is XL Never worn and no stains or tears. Great for any fan or collector, and hard to find! Pearl Jam - 2009 CD Spectrum Box Set with trading cards used. 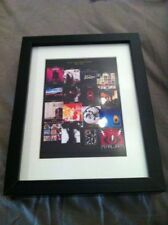 This is the official Pearl Jam 2009 Philadelphia Spectrum CD box Set. 4 Complete shows. Includes the six trading cards. Trading cards are 100% mint condition as well as the CD's. Minor ding on back cover box. Temple of the Dog 2016 Tower Theater Poster Chris Cornell Vedder Pearl Jam Note, Each Poster Has A Soft Corner. This is an original poster, not a reproduction. The poster will be shipped in a corrugated tube and kraft paper. Pearl Jam Mexico City 2003 Tour Poster 20x15cm from Book to Frame? Pearl Jam Dublin Ireland 2010 Tour Poster From Art Book 29x17cm to Frame? FROM ART BOOK. ITEM BETTER THAN PICTURE. Pearl Jam Rushmore Arizonia 1998 Tour Poster 27x15cm from Book to Frame? Taka Hayashi is a very cool artist who is best known for his iconic designs for VANS. In excellent condition! It has a couple of very slight dings from being in storage but otherwise like new. Very hard to find item! Would make a great addition to any Pearl Jam fan's collection. arrival to you. 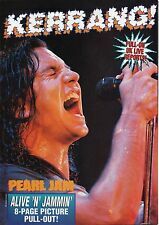 Pearl Jam Eddie Vedder on Stage with Song Book 25x20cm from Book to Frame? EDDIE VEDDER, AS TITLE. BETTER THAN PICTURE. GREAT CONDITION. Pearl Jam Boston 2004 Tour Poster Copy Small 13x9cm from Book to Frame? Mike McCready Cap CCFA Hat SEATTLE MARINERS SGA 9/8/17 SGA PEARL JAM New. Shipped with USPS First Class Package. Pearl Jam Early Band Info. and is One Page from Magazine ONLY. First Single info & Album Date info. 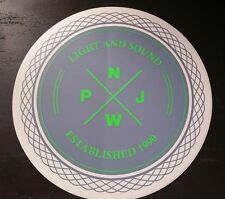 Pearl Jam Seattle Sticker Music Rock Band 4.5"